The Court has gotten so ridiculous these days, so surreal and nonsensical, that it seems a lot like a cartoon. Whether it’s Thomas with his lobbyist wife, Scalia doing Republican fundraisers, or Alito acting out during State of the Union Addresses, there’s no shortage of bad behavior, the sort of antics that in any other era would have been grounds for impeachment. Then of course, sadly, there are the decisions, the Roberts Court always anxious to improve the lot of corporations, lobbyists, and religious zealots. Based on Article III, you don’t have to be a citizen, a human, or even real, strictly speaking, in order to be a Supreme Court Justice. In fact, a theory could, theoretically, qualify. So could a god, a demon, an angel, a wildebeest, a Rubik’s Cube, a goat turd, and a feather. As long as the President nominates someone (or something) and the Senate confirms same said someone or something, that’s that, whether you’re animal, vegetable, or whatever-al. Unlike the Presidency and Congress, there are NO SPECIFIC REQUIREMENTS to serve on the Supreme Court. We can do whatever we want, and if we can save a little scratch using real cartoon characters instead of the phony ones we’ve got sitting the bench now, why the Hell not? A friend to corporate interests, Chief Justice Roberts will probably prove hardest to remove from the bench. He’s young and in all fairness the guy seems pretty smart and sane (more or less). Plus, being conservative and a corporatist, the movement to keep him stands to have the greatest backing from lobbyists. You know, PACS, Super-PACS, Quasi-PACS, Mega-PACS, dark money, light money, shadow money, and whatever other inhuman constructs the last several years of campaign finance decisions have foisted on us. As a result, we’re really going to have to come up with someone that corporate interests will be able to rally to. I thought of Superman (“Truth, Justice, and the American Way” and all that). Velma from Scooby Doo seemed like she’d be a good choice, too. Velma’s smart, her insights integral to the solution of many a cartoon whowhatwhywhenwheredunnit, and her morals are beyond question (just look at those sweaters). Even Judge Dredd seemed to make sense (though obviously not the Stallone version, yiesh.). But I doubt the lobbying industry would go for any of those. To get rid of Roberts, we’re going to have to let the lobbyists keep one of their own in the big chair. Why not, then, somebody already used to being in the biggest of big chairs, Mr. Burns from the Simpsons? He’s old and liver-spotted, owns a nuclear facility, and has personality swings that run from the diabolical to the reactionary, the fascist to the vampiric. Name one of these qualities that wouldn’t be appealing to Republican lobbyists? 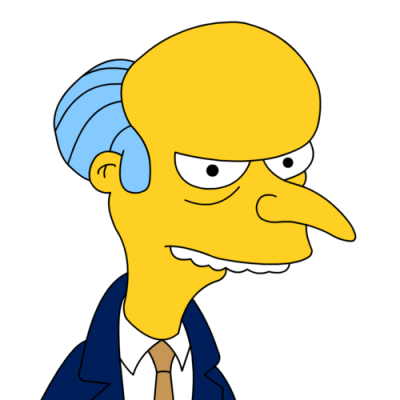 Plus, Smithers would be willing to clerk for him ad infinitum (For free!). With the Burns appointment we come to one of the main problems with any approach to Court composition, even the one currently in place: factionalism. Once Burns is in, the calls of Simpsons’ favoritism will go up almost immediately. You know they will. Which means that even though they’d make EXCELLENT Justices, Homer, Marge, Maggie, and Ned Flanders are all out of the running. Maybe that’s for the best though. There’s a big universe of cartoons out there: Marvel, DC, Looney Tunes, Hanna-Barbera, Disney. And diversity in our cartoon Court is important, even if we haven’t been that successful with diversity in our real Court. You could probably fill an entire Court with Looney Tunes characters. But we have to be fair to every American, so we have to select from as many different cartoon pantheons as we can. Thus, Bugs and Taz, Fudd and Porky, Tweety, Sylvester, and even the Martian are out of luck. The Martian’s exclusion is particularly bothersome since he would have not only represented space aliens, but cartoon space aliens to boot. Still, we have to think about what’s best for the Court…and the Country. Given Scalia’s whimsical decisions of late, it’s easy to see Daffy replacing him. You know, the Daffy who gets trapped in the djinni’s treasure vault for cartoon forever (ten seconds) crying, “Mine, mine, mine,” as we fade away. Capable of complex speech made up entirely of the syllables of his own name, “Pika pika chu chu chu pika pika pika chu,” Pikachu would be the perfect replacement for Clarence Thomas. Sure, we’ll need subtitles to understand him (Her? It? ), but that would still be an upgrade. Justice Thomas rarely speaks let alone writes an opinion (his comments opening up the possibility of a legal theocracy not withstanding). Plus, Pikachu is most likely asexual so we probably wouldn’t have to worry anymore about Thomas’s former colleagues coming forward with tales of his misdeeds. And, again, the inclusion of a Pokemon on the Court continues our theme of cartoon diversity. I mean, I’m not even sure what a Pokemon is. I guess in one sense that’s about as diverse as you can get. I like cartoon evil. It’s fun and jokey and never wins. These all represent bonuses compared to real evil (Vladimir Putin, Chick-fil-A, Walmart) and the even less realistic, albeit much scarier, metaphysical variety of evil (Satan, Dracula, corporate get-togethers). Still, I took great pains to avoid putting too many evil characters in this proposal. Even amongst cartoon evildoers, Maleficent represents something of a wildcard. Mistress of All Evil? The chick who poisons Sleeping Beauty? I mean, how low is that? She’s got her own set of black robes, though, so that’s a win. And she can perform magic which means that if SCOTUS is ever attacked by demons, extra-terrestrials, or the risen corpse of Roger B. Taney, she’ll be able to protect her fellow Justices (assuming she wants to). Does she recall Justice Alito, the guy she’s replacing? Oh, I think so, what with her phony smiles and genuine sneers. Catwoman goes both ways as far as good and evil are concerned. She’s complex, inscrutable, and feline—much like notorious “swing vote” Justice Kennedy. You really never know what the guy’s going to do. Some days it’s states’ rights, others it’s not states’ rights at all (see Bush v. Gore). Free speech, gun control, and eminent domain: Kennedy stakes out positions that seem designed to confuse and infuriate almost everyone. So, who better to replace him than Catwoman? Sometimes she works with Batman (sometimes she even LOVES Batman). Others, she teams up with The Joker, The Riddler, The Penguin, and (Not The) Bane. Liberals are often accused of being unwilling to take a stand on tough issues. Not so for Dr. Bruce Banner, aka the Incredible Hulk. Not only would he provide unparalleled scientific knowledge, helping the Court adjudicate issues as important as genetic engineering, artificial intelligence, gamma radiation absorption, and random physical transformations that are sometimes controllable, sometimes not. Hulk also knows when to smash. Which is good. Because when it’s time for oral arguments to end, it’s time for them to end. Rocky is plucky and clever, the brains behind Bullwinkle J. Moose (a contender for Associate Justice in his own right). He (or is Rocky really a she?) would be a welcome addition to the Court. Either way, who cares, and in truth he/she might be our first trans- or non-gendered Justice. Second thought, that might be Pikachu. But there’s no need to argue. They can both be whatever they want or are. This Court is about diversity. Well versed in dealing with xenophobic symbolism, escaping inescapable traps, and vaudeville showmanship, Rocky is also an expert in international espionage and the Cold War battle for world supremacy (see Boris, Natasha, and Fearless Leader for Rocky’s bona fides). As a result she (or he) would know just how to handle the various Constitutional issues at the nexus of national security and the Bill of Rights. Gitmo, Edward Snowden…all that stuff. Calm almost to the point of sedation, Kanga is mother to Tigger’s bouncy, fun-loving protégé, Roo. Now, I’m a big Tigger fan, so I’d have rather seen his black and orange spring-loaded magnificence allowed to bounce nonsensically around the High Court. But Scalia’s already been replaced with Daffy, who is, in fairness, pretty bouncy himself at times; and, in additional fairness, considerably more clever than Tigger. Daffy’s also pseudo-evil (Tigger’s nothing of the sort) which is sure to please Republicans. For these reasons, Tigger’s out and Kanga’s in. Danger Mouse is a British secret agent who’s also, not surprisingly, a mouse. Some will claim a developing “inhuman faction” comprised of duck, kangaroo, squirrel, and now mouse. First off, that’s only four out of nine, which isn’t a majority. Second off, they’re cartoon animals so, strictly speaking, they’re not really animals at all. They’re cartoons. Third off, Danger Mouse being British and a secret agent would provide us with a different, much needed perspective on the Court. Anyway, you can’t seriously think that Daffy, Kanga, Rocky, and Danger would agree on much at all. They’re from different cartoon universes. I mean, who knows if they’d even be able to understand each other. They might need simultaneous interpreters. And there it is: the hidden beauty of my cartoon Court. Who knows if it would work in practice? I mean, I’m sure we could animate it, film it, get top-notch voice actors; but who knows if it would really be able to accomplish anything at all? And wouldn’t that be for the best? Because if the choice is between a theocracy controlled by corporate lobbyists and a Supreme Court filled with do-nothing cartoons, wouldn’t we be better off with the cartoons?